Sleep expert Motty Varghese explains why we need to look at our ‘sleep drive’. SPENDING A LITTLE too long in bed these mornings? If you find yourself yawning throughout the day, you’re not alone. Almost a third of Irish people would like to improve their sleep, according to Healthy Ireland. 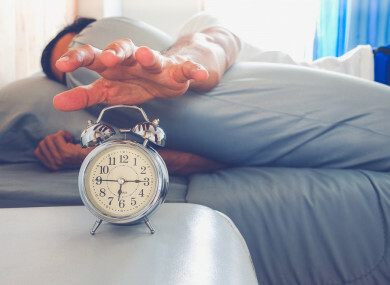 And last week in the latest installment of The Health Check with Irish Life Health, we found out that overall, we’d only rate our sleep satisfaction as 5/10, and our likelihood to wake up feeling tired in the morning as 6.5/10. So, what’s keeping us up at night? We spoke to sleep physiologist and sleep therapist Motty Varghese of Sleep Therapy Clinic in St James’ Private Clinic to see what these results mean and what we can do to improve them. One of the ratings that really stuck out was readers’ satisfaction with their sleep. At 5/10, this has been the health element that our readers are least satisfied with, over both their diet and their fitness. But it’s a rating that comes as no surprise to Varghese: “A lot of people would have complaints about sleep for various reasons.” The biggest of these? “The introduction of technology into our daily lives has had a huge impact on sleep”. But more on that later. According to Varghese, about 10-15% of us have insomnia – and if you take longer than half an hour to fall asleep at least three nights a week, you could have it too. Another significant worry for our readers was how sleep can interact with our minds – with readers rating a 7/10 for how connected they feel their sleep is to their mental health. And it’s a valid worry, according to Varghese: “Poor sleep can have a very significant impact on mental health – you’re not going to be in a good mood during the day.” He notes too that depression and anxiety are very common for insomniacs. We often see poor sleepers who may have come across TV programmes saying they need 8 hours. Then they’re striving for this and it doesn’t happen, which puts even more pressure on them. This doesn’t surprise me actually, for many factors. People have very busy lives and kids need to be looked after and dropped to school. In fact, if you’re craving more than 10 hours a night, it can be an indicator that other things are wrong: “It does raise a question about the quality of sleep, and why it’s not refreshing”, says Varghese. However, this can be just a matter of improving our sleeping environment, which we’ll tackle later. The benefits of a good night’s sleep are multifaceted, says Varghese – from making you more productive in work to making you safer on the roads. And unfortunately, not getting enough can become a vicious circle. When we’re tired, we not only tend to look for higher calorie food but our decision-making abilities are compromised – explaining why we don’t tend to go for the green apple, we reach for the burger. You can thank two ‘hunger hormones’ for this need for higher calorie food – ghrelin and leptin. When we haven’t slept well, we produce more of them, meaning we feel the need to eat more. And when we gain weight, snoring and sleep apnea are more likely to become an issue, further impacting our sleep, says Varghese. According to Harvard Health, keeping the same sleep schedule throughout the week can be a way to ensure that you get good quality sleep every night. And readers rated habits like this as a 5.7/10 in importance. If you sleep until 10 or 11 in the morning and go to bed that night, you may not have enough sleep drive. This is determined by the number of waking hours we have before bedtime. This is very, very, very common. People turn off their handheld devices just before they turn the light off when they shouldn’t touch them for two hours before bedtime. So, how do we get better sleep? It’s worth assessing whether you are a morning or an evening person says Varghese, and to try to amend our work to suit this, especially if you have flexible working hours. Sleep can be a “huge factor for productivity”, and getting suitable start times and “offering sleep programmes makes a big difference”. How’s your diet? Most of you said it slips with stress – so what can we do to improve it? How fit do you feel? Our readers rated 6/10 – but what can we do to raise that? Over the next few months as part of The Health Check, we’ll be capturing a snapshot of our health as a nation with Irish Life Health. We’ll be compiling anonymous, real-time ratings and talking to experts about the results and what they mean for our health. We know Irish Life. We are Irish Life Health. Email “How's your sleep? Readers gave theirs only 5/10 - but here's how to improve it”. Feedback on “How's your sleep? Readers gave theirs only 5/10 - but here's how to improve it”.